To me, a digital scales is one of the most important pieces of kitchen equipment I own. I think I have a mild case of digital scales OCD. I weigh everything, partly because I write lots of recipes and I need to get the ingredients spot on, and partly because it's an obsession. I especially weigh things like pasta and rice. Why? Portion control. If I cook too much I will most certainly eat too much. Who doesn't love carbs? For baking it's a must - sorry but I just can handle cups! They're just not precise enough! Why risk an epic baking disaster with a cup? OK, so they do manage just fine in the states, and Australia too and other countries but I can't be dealing with it personally. I was a scientist pre-blogging life, I think my desire to be utterly precise might be linked to that. Also it's got to be digital - none of this analogue lark, you might as well have a cup *shudder* as quite frankly they are not to be trusted. And those cast iron scales with the little weights? They get dusty and they fall on your toes - ouch! They make good photo props but not for cooking equipment. This is just my humble opinion though. When my old digital scales recently packed in I was sent this beauty from Brabantia. It's the Brabantia Essential Line Digital Kitchen Scales in White, but it also comes in a lovely shade of lavender and green. It's just over £20 on Amazon, and it's worth every penny. The entire surface is glass making it a completely wipe-able surface. No little buttons to get flour trapped in or liquid splashed on. The buttons are just under the glass surface, and when it wipes clean it really is clean, unlike a stainless finish for example, not that I'm OCD about cleaning, just weighing. This is the perfect scales for a breadmaker owner as it's the perfect size for your breadpan and also the units change from grams to mls so you can weigh the water as you pour it in. I only use the mls for weighing water and not oil as oil is lighter. I prefer to measure oil in a jug. Again, this is just my humble opinion. This scales is just the right size - not too big, not too small and not too heavy. Pop you bowl on it, press tare and add your ingredients. The unit display is in metric and imperial for fluids and soilds. It also has a little hook for hanging it up on the wall. It's such a sleek and smart design as well as being functional, useful and affordable. I just love those clever people at Brabantia. 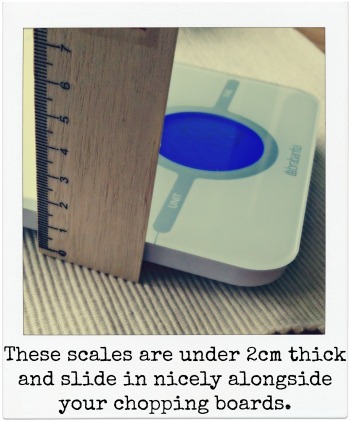 Disclaimer: I was kindly sent these scales from Brabantia - I decided to write about them because I genuinely love them. This is not a sponsored post.